A slipped disc is just another name for a herniated, protruding, or bulging disc and is commonly linked to “pinched” or irritated nerves. Slipped discs can cause different types of pain, muscle spasm, numbness and tingling when they impinge on the nerve root. In order to find out where your pain is coming from a History, Physical Exam (Neurological, Orthopedic & Chiropractic), and possibly diagnostic tests including X-Rays, MRI, or a CT Scan may be obtained to pinpoint the spinal level of your problem. In 1998, I had to sell my practice in Santa Barbara because of severe lower back pain and right leg weakness due to my herniated discs. 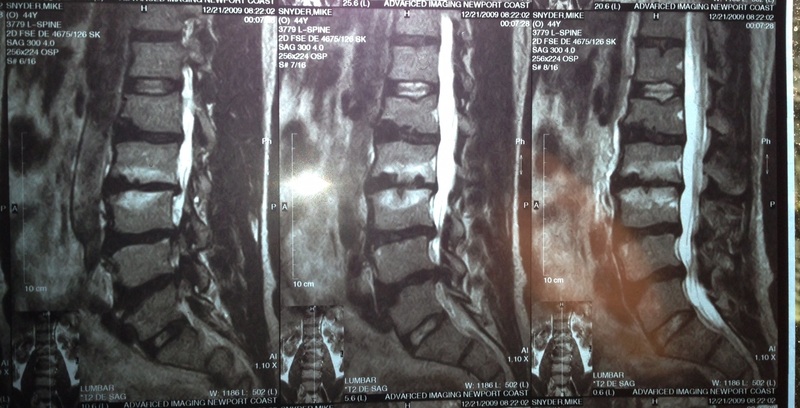 Patients often ask me how I am able to surf, snowboard, play tennis, run, play sports with my kids and be so active with 4 herniated lumbar discs and a herniated disc at the base of my neck that range from 2-5mm. I get Gonstead Chiropractic Adjustments; do stretching and strengthening exercises; practice yoga regularly while being careful to limit lumbar flexion and hinge at the hips; use High Power Laser Therapy and I am extremely careful to maintain the cervical and lumbar lordosis (forward curve) in the neck and lower back at all times.